Bison in their natural winter habitat, a snow covered grass pasture. I recently posted a detailed description of the ranching methods at Northstar Bison, where Lee and Mary Graese raise superb grassfed bison. Or rather, they pretty much let the bison raise themselves. Most of what the Graeses do is rotate the bison from one fenced pasture to another. This high-intensity rotational grazing actually renews the soil, instead of depleting it like modern commodity agriculture. 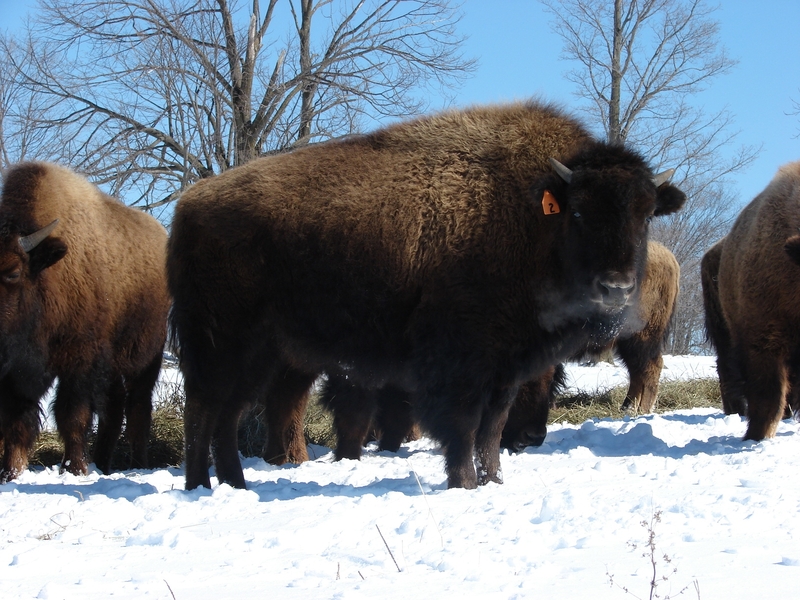 The bison select their food, all year round, digging right through the winter snows to reach the grass underneath. Their thick coats keep them warm in winter. The bison cluster together in a tight herd to defend against predators. They deliver their own healthy young, without human interference. They are healthy, hardy animals, who do not need or benefit from human doctors. And they let the ranchers know when it is time to move to a new pasture, by clustering around the gate when it is time for them to move to another pasture. The meat from these bison has a wonderful, slightly sweet, unique taste that is nothing like commodity beef. It has all the nutritional benefits of wild game, because the bison are eating their natural diet and are pretty much taking care of themselves. This fine meat does not have the gamy taste associated with wild game, because the bison are killed instantly, by surprise, and do not suffer. This wonderful ranching accomplishment has received some well deserved recognition. Kimberly Hartke of the Hartke is Online blog has given Lee and Mary Graese her “Heroes of Sustainable Agriculture” award. Here is a link to the guest blog post I did, where the award is announced. Here is a link to a guest recipe post I did on the same blog, which details a simple and delicious way to cook bison steak. 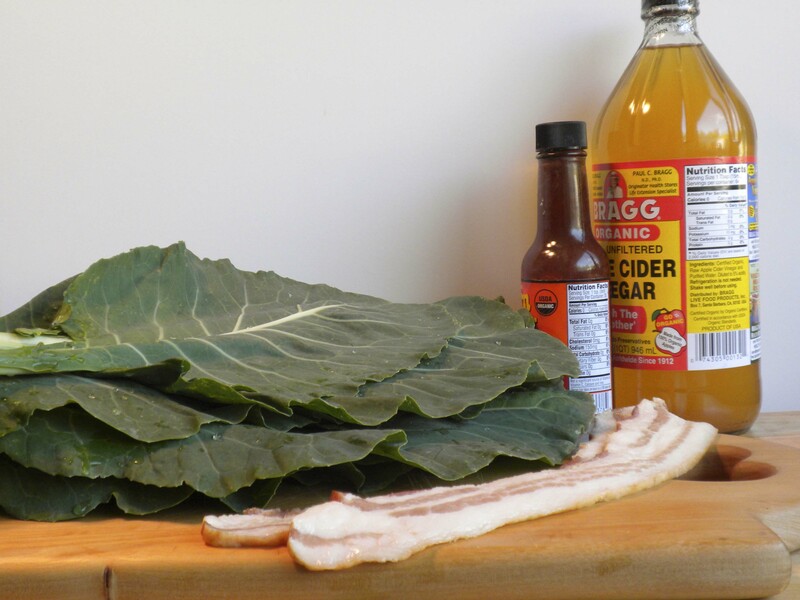 Ingredients for traditional organic collard greens with natural uncured bacon, organic hot sauce, and unfiltered raw organic apple cider vinegar. While grassfed meat is my favorite food, part of the pleasure comes from eating it with delicious side dishes. Some of these side dishes are so good they become favorites, and are made time and time again. The recipe in this post is one of my favorites, and I have made it often. It goes wonderfully with every kind of grassfed meat. I love to make this dish with collard greens that have deep green, firm leaves. Collard greens originated in West Africa, and are loaded with nutrition, with many vitamins and minerals concentrated in their deep green leaves. They are a staple of traditional soul food. Traditionally, collard greens are cooked for a very long time, with some kind of fatty pork. More modern versions cut the fat, but not mine. I keep the pork fat but reduce the cooking time. I happened to mention this recipe during an Internet chat on Twitter that was sponsored by Seeds of Change, a wonderful organic seed company that is preserving real organic seeds and making them available. My good friend Kimberly Hartke, of the blog Hartke Is Online, asked me to post the recipe, so here it is. 1. Wash the collard greens well with filtered water, making sure any soil or sand is washed off. Remove the leaves from the stem, tearing the leaves into 2 to 3 inch pieces. Discard the stems. 2. Pour 2 quarts filtered water into a stainless steel pot with the bacon, and bring to a slow boil. Cover, and cook for 10 minutes. This will cook a lot of the fat into the water, where it will really flavor the greens. 3. Add the greens, vinegar, and hot sauce to the pot. Bring the pot back to a strong simmer. Cover, and cook for 20 minutes. Remove the greens to a serving dish with a slotted spoon. Serve and enjoy with the grassfed meat of your choice. This recipe goes perfectly with the recipes for grassfed meat contained in my cookbook Tender Grassfed Meat. 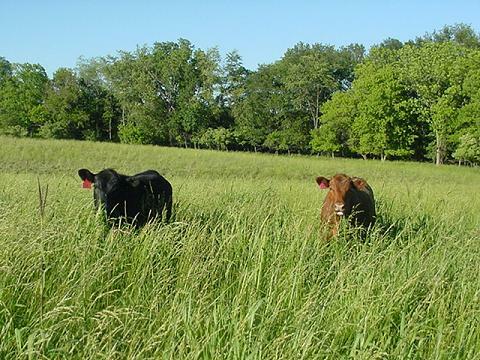 Happy cows grazing on rich grass grown on soil restored by John Wood of U.S. Wellness Meats. Earth Day was created to appreciate and encourage the preservation of the natural blessings of our planet. Perhaps the greatest threat to our planet and ourselves is the massive loss of good soil that has been going on since the last century. Without good soil, most life cannot ultimately survive. The attack on our soil has been led by the chemical industry, and factory farmers who abuse the land, killing the very life in the soil, causing erosion, and a reduction in usable water. Massive soil erosion leads to deserts. Yet it is not too late to save and restore our soil. Conventional science, with its incomplete knowledge and obsessive focus on grants and profits, is not going to save us. In fact, it is the products of conventional science, such as pesticides, artificial fertilizers, modified plants and germs, and massive chemical pollution from artificial chemicals that are the greatest cause of the problem. But nature itself can save us, if we have the humility and wisdom to follow nature’s laws. Nature itself has left a blueprint on how to make good soil, and tens of millions of desert acres have been turned into fertile grasslands, with long-dead rivers and streams coming back to life as part of the process. This was accomplished by following nature’s laws. Soil that will nourish healthy life is much more than just dirt. It is a magnificent combination of minerals, bacteria, insects, microbes, and many nutrients (including unknown substances), all coming together to form the very source of life. Plants need soil to grow, and soil needs plants to hold it in place against wind and rain, or it just erodes away. The nutrients in the soil grow the plants that keep the soil in place. These nutrients nourish the plants that grow in this good soil, and the nutrients go into the plants, which pass these nutrients on to the people and animals who eat them. Food plants grown in good soil contain many vital nutrients that we all need to be fully healthy. Animals grazing on these rich plants develop nutrients in their flesh, fat and organs which are crucial for human health, and which are only there if the animals get all the nutrients they require. It is crucial to understand that science has not identified all of these nutrients, and does not know everything about how they work together. But our bodies know, and expect all these nutrients to be there in the food we eat. Dr. Weston A. Price discovered that traditional peoples eating the diets of their ancestors, foods from animals grazing on rich soil, plants grown in rich soil, or seafood taken from the rich ocean, were immune to tooth decay. This immunity went far beyond tooth decay, as these people did not have cancer, heart disease, asthma, allergies, birth defects, mental problems, or any of the host of chronic diseases that torment modern humanity. Dr. Price understood that good soil was the mother of good food, and included a chapter on the vital importance of soil in his magnificent work, Nutrition and Physical Degeneration. Growing and harvesting certain crops depletes the soil of nutrients. Farming the same soil year after year could lead to erosion. The traditional solution was to rotate fields, to let the land rest and renew, or plant certain crops that would restore nutrients to the soil. Natural fertilizers like animal manure were also used. These solutions worked, but part of the land could not be used for food crops while it rested. Science supposedly “solved” this problem by using artificial fertilizers. These fertilizers enabled crops to grow in depleted soil. The same land could be used for crop after crop, without rest. But these fertilizers only provided some minerals and nutrients, not all of them. In fact, some of these fertilizers interfered with the ability of the plants to absorb nutrients. The plants that grew from the depleted soil were weak and far less able to resist pests, so artificial pesticides were introduced. Pesticides are poisons that kill plants and insects. The introduction of these poisonous artificial chemicals into the soil changed it, having a dramatic effect on the life in the soil, and killing much of that life. Soil is also damaged and changed by artificial chemicals created by industry, which are not part of the natural cycle. Soil is also damaged and contaminated by the huge amounts of manure and liquid created by CAFOs (Concentrated Animal Feeding Operations). The miserable animals in CAFOs are crammed together in a small space and not allowed to graze. They are fed grains and other species-inappropriate feeds. This cruel and unnatural practice creates huge lagoons of manure and urine that greatly exceed the ability of the land to absorb them. The result of this artificial tampering with the soil was less nutrients. Plants cannot have nutrients that are not in the soil. Food animals cannot have nutrients that are not in the plants. People cannot get nutrients that are not in the plants and animal foods we eat. Our bodies cannot function properly without all the nutrients we have evolved to need. Artificial agriculture has caused a huge loss of useable soil, a serious loss that is continuing. And the soil that remains has far less nutrients. Even in the 1940s, studies showed that fruits and vegetables had far less vitamins and minerals than vegetables grown in the 1920s. The situation is much worse today. For example, researchers have tested commercial oranges that contained hardly any vitamin C.
We can restore the health of the soil by following nature’s laws. The Great Plains of the United States were some of the richest land ever known on earth. Before the plains were fenced and farmed, more than 60 million bison roamed the plains. The bison traveled in tightly packed herds, so they could defend each other against predators. The herd would travel into an area, eating all the grass, and breaking up the earth with their hooves and concentrated numbers, using their hooves to expose more grass. As they ate the grass, seeds would fall off and get trampled into the earth by the hooves of the massed bison. They would deposit their manure on the soil, returning the nutrients to it. In effect, the bison actually farmed the land. They harvested the grass by eating it. They plowed the land by breaking it up with their hooves. They planted the new grass by trampling the seeds into the earth. They fertilized the land with their manure. Then they would move on, leaving the land to rest and grow. By the time the herd returned, they would be greeted with a new crop of rich green grass, and the cycle would begin again. All of the great grasslands in the world were created in this manner, with different types of animals and herd sizes. But the blueprint remained the same—the animals were concentrated into tight herds, the herd grazed in a concentrated manner, then moved on, allowing the land to rest, recover, and regrow. Many grassfed ranchers follow these methods, concentrating their herds, doing intensive grazing, then moving the herds so the land can recover. Some of these ranchers add additional natural nutrients to their soil as well. (See Grassfed Farmer Renews the Land.) Every time I buy grassfed meat, I am supporting these ranchers who are restoring the soil with their herds. Every time I eat the meat and fat from animals raised on rich grass, I am blessed by receiving a full natural range of nutrients, giving my body exactly what it needs to function properly. These methods have been adapted and used to literally change millions of acres of desert into grassland. Even long-dead streams have come back. We can restore our good soil to the earth, by following nature’s laws. If you have eaten bison recently, you probably think it tastes just like conventional beef. That is because 95% of the bison sold in the U.S. has been fed the same horrid corn-soy diet that is given to factory beef. But real bison, grassfed bison, tastes nothing like that. Real bison has a mild, distinct, slightly sweet taste of its own. A primal flavor, that is unique and wonderful. A fresh, compelling taste that tells your body to keep eating, something incredibly nourishing and satisfying is happening. Eating real bison makes me very happy, on many levels. And the feeling of satisfaction and fulfillment I experience when I have eaten enough real bison is something special. There is something in real bison that refreshes, renews, revitalizes, and satisfies. I do not know what it is, but it is definitely there, but only in real bison eating its natural diet of grass and meadow plants. One of the very few places you can get bison of this quality is Northstar Bison, a ranch where they raise wild bison with no artificial feed. How do they raise something that is wild? Well, the bison mostly raise themselves. The ranchers only manage the grazing, using techniques that renew and enrich the land, following the patterns established by the bison themselves. Nature has developed its own way of creating great soil. A prime example is the Great Plains of the United States of America, which were some of the richest land on Earth. Once, the Great Plains were roamed by huge herds of bison. The number of bison has been estimated at over sixty million. These bison roamed the plains in immense herds. Witnesses to these herds in the nineteenth century wrote that it took days for these herds to pass a particular spot. These herds would literally break up the land they grazed on with their hooves, eating the older growth, trampling the seeds deep into the earth, and enriching the soil with their manure. This enabled microorganisms in the soil to thrive, to fill the earth with life. Because the bison herds were so concentrated, they literally changed the land they grazed on. This was nature’s way of harvesting, plowing, fertilizing, and planting the earth. The bison would then move on, allowing the land to rest for months before they returned. The land would use this time to grow rich new grass, in soil that was even more fertile than it had been. The roots set down by the grasses would hold moisture in the soil, helping the growth of the microorganisms that filled the soil with life and nutrients. Then the bison would return, to thrive on the rich new grass and start the whole cycle over again. Northstar Bison was founded by Lee and Mary Graese, on the site of an old dairy farm. Lee Graese had been fascinated by bison since he was a small boy, and always wanted to have some. The ranch is a fulfillment of his dream. The Graeses are devoted to raising real bison, in the most natural way possible. They have studied natural grazing practices, and put them into effect on their ranch. The method used is called intensive grazing and rest, and follows nature’s ways. The bison are concentrated in a particular pasture, and then moved to a new pasture when the time is right. Just like their ancestors, they enrich the land they graze on. Once the bison have left the pasture, the land is allowed to rest, renewing itself with the resources contributed by the bison. The new grass is allowed to grow. When the bison return, the grass is richer than ever. This method of ranching enriches and restores the soil, rather than depleting it. 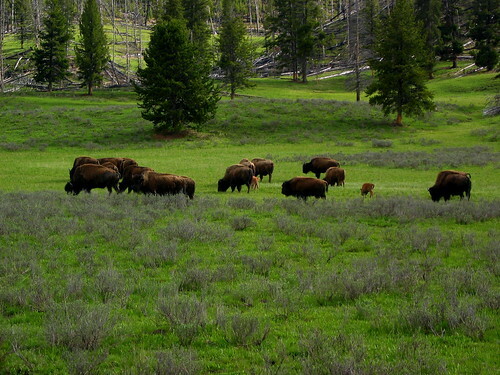 The bison eat grass and meadow plants, selecting their own feed from what grows in the pasture. They can do this even in winter. The bison are able to smell grass under two feet of snow, and they actually dig through the snow to reach the grass. There is only one time when the bison are given supplementary feed, which consists of sun-dried hay from the ranch. When there is a thaw in the winter, the snow can melt. When the weather gets down to freezing again, ice forms that can make it difficult for the bison to reach the grass. The sun-dried hay is made available to the bison at these times. The ranch is home to various predators, including bears, coyotes, and wolves. The bison are so good at protecting themselves and their young that the Graeses have never lost a calf to a predator. The bison are healthy, robust animals that rarely, if ever get ill. Sometimes they do get injured when they fight among themselves. When they are sick or injured, they have a way of hiding their weakness so a predator will not target them. The bison deliver their own young without aid. These healthy, unmodified animals do not need human help to reproduce or give birth. In fact, the main way the Graeses manage their herd is to move them to new pastures. For bison, the grass is truly greener on the other side of the fence. The bison know when it is time to move to new pasture, and it is routine for them to gather at the gate when they want the Graeses to open it. The Graeses use the field kill method. Every hunter knows that the meat of an animal which is killed by surprise will taste much better than the meat of an animal which is chased. This is because adrenalin and other hormones are released into the bloodstream when an animal gets scared or angry. These hormones give a very gamy, bitter taste to the meat. Since the dawn of time, hunters have always tried to kill the animal instantly, by surprise, to avoid the meat being ruined by these stress hormones. Another benefit is that an animal killed this way does not suffer. The field kill method consists of shooting the animal from behind, without warning. A steel-jacketed bullet is shot into the bison’s head just behind the ear, which results in immediate death, without suffering. Because there is no suffering, none of the stress hormones are released into the meat, which remains sweet and is not even slightly gamy. Since a steel-jacketed bullet is used, there are no lead fragments in the animal from the shooting. The meat sold by Northstar Bison is as real and natural as meat can get. No added hormones. No antibiotics. No feedlots. No species-inappropriate feed. No chemicals. What you get is meat that is the equivalent of wild game, with all the natural nutrients. This meat is particularly rich in nutrients because the animals graze on grass growing in rich soil, soil which is full of minerals and other nutrients. Bison is naturally lean, but the fat is full of omega-3 fatty acids, CLA, and other beneficial nutrients. There is also what I call the “y factor.” There is something in grassfed bison that makes me feel better and satisfied. I do not know what it is, but nothing else has it. My hunger is also satisfied with a smaller amount of bison meat. It is so dense with nutrients that my body is satisfied with less. When you are satisfied, the desire to eat is over. Grassfed bison must be cooked properly, or it will be tough and not taste good. Tender Grassfed Meat has many bison recipes that result in delicious bison. I am very grateful that the Graeses have made their terrific meat available over the Internet. I have been a happy customer for many years. Northstar Bison also owns the facility where their meat is processed. This means that they can easily custom cut your meat. It is important that you know what you want and describe it in detail, but they can get it for you. I have taken full advantage of this flexibility to order cuts that are not on their regular price list. 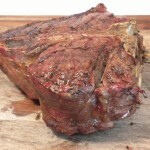 This is a great way to get really thick steaks and bone-in roasts. The regular selection of cuts at their online store is huge, but you can ask them to custom cut additional selections. One of my favorite custom orders is bison suet, which you can order separately, and is actually a very popular item. Wild bison meat, from animals that have been fed only grass and hay, is one of the tastiest and best meats you can eat. My thanks to the Graeses for making this healthy and delicious meat available. The Standard American Diet (also known as SAD) is severely deficient in many vital nutrients. This includes iodine, which is vital for the function of many body processes. The recent nuclear disaster in Japan has motivated many people to raise their iodine levels, in the hope that this will prevent them from absorbing radioactive iodine. Most people who do this use supplements. There is a risk in using supplements, because iodine is only needed in minute amounts, and an overdose of iodine can cause problems ranging from minor to serious. While I am not a doctor, and am not giving medical advice, I always prefer to get my nutrients from food to the extent possible. I believe that this is the most natural and efficient way to get nutrients, along with any as yet unknown cofactors that enable the body to digest them properly. The healthy peoples studied by Dr. Weston A. Price usually had much more iodine in their diets than modern people. One of the most common ways they got this iodine was from eating seafood. Some seafood contains a significant amount of mercury, a substance that I avoid as much as possible. However, small fish and shellfish contain very little mercury. Our ancestors ate only wild fish, taken from their natural habitat, and that is a tradition I follow. 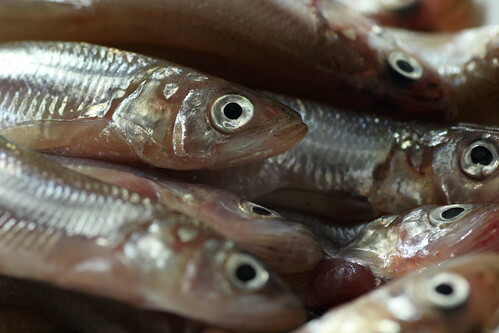 Farmed fish are almost always fed a diet that is not natural for seafood, usually including processed soy, and they are not the same as wild fish. This soup is simple to make, delicious, and loaded with iodine and other nutrients. The use of small fish avoids the mercury problem, and the ginger and garlic reduce the odor, while enhancing the already fine flavor. The fish sauce adds even more nutrients, while further improving the flavor. The long simmering causes the fish to break up and release their nutrients into the broth. 1. Put the fish into a large stainless steel stockpot. There is no need to cut up the fish, they will break up as they simmer. Add the vegetables and the water. 2. Heat the pot until the water begins a strong simmer. This will take a while because of the large volume of ingredients and water. 3. When the water is close to boiling, remove all the scum that rises to the top with a skimming spoon. This can take a long time, but it is necessary to remove these impurities. 4. When the scum is gone, add the fish sauce. 5. Cover and simmer gently for at least 8 to 10 hours, or even longer. The fish will break up into the broth. 6. Strain into mason jars, cover, and refrigerate once the bottles have cooled down. Use or freeze within five days. If you freeze the broth, you can boil it down to a concentrate, place in safe plastic freezer bags when cool, and rehydrate when you thaw it at a later date. 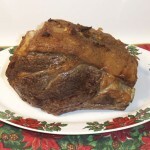 Tender Grassfed Meat contains a number of broth recipes for grassfed meat.